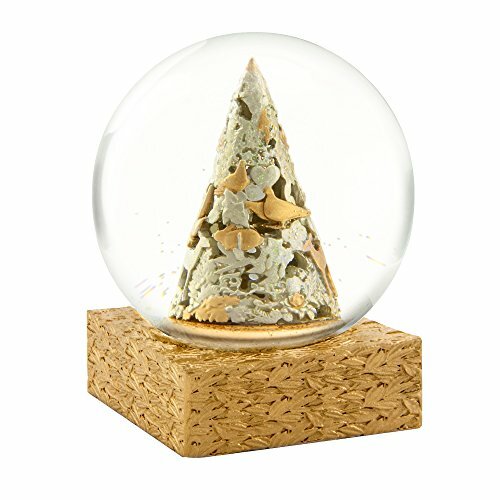 CoolSnowGlobes' Baroque Christmas Tree holiday snow globe pays tribute to the 17th- and 18th-century style of art, reveling in the exuberance of detail. The opulent animals, leaves, and flowers remind us that a Christmas tree is more than the sum of its parts. It encapsulates rich traditions, the warmth of festivity, and, of course, the majestic way light glints off gold ornaments. And remember, in our fast-paced world snow globes make treasured gifts. They give people peaceful quiet moments and cherished memories to last a lifetime. CoolSnowGlobes embraces the long history and rich traditions of water globes, adding fresh new designs for contemporary times. Baroque Christmas Tree features an intricate network of gold and silver ornaments on an antique Christmas tree. Golden flitter shines throughout. Attached resin base has a decorative leaf pattern and is painted antique gold. Glass globe has 4" diameter and fits nicely in the hand. Overall dimensions: 4.5" x 4" x 4" (h x w x d) and weighs 2.5 pounds. If you have any questions about this product by CoolSnowGlobes, contact us by completing and submitting the form below. If you are looking for a specif part number, please include it with your message.